Benefits: Transportation to the camps and host communities, flexible working hours. “We are supporting you in what you are already good at, yes, but more importantly, we’re supporting you to use your judgment and act in the best interests of vulnerable young people to create transformational change”. Capoeira4Refugees (C4R) is not a capoeira school. C4R is a social organisation that supports grassroots capoeira initiatives to help traumatised children and youth, particularly refugees. C4R’s approach is respectful to all capoeira styles and traditions, and we do not follow any particular school. Our goals include using principles of capoeira training, such as the development of confidence and self-respect, to produce positive social impacts, such as decreased levels of violence and aggression, improved mental health, better school performance and increased positive behavioural choices. Capoeira4Refugees was founded in 2007 working with street children in Syria (where it still has projects). C4R has been active in the West Bank, Palestine, since 2011 and in Jordan since 2014. This is a hands on role, where the trainer must show initiative and be able to work closely with volunteers and partners to get the job done. You will build strong relationships with your students to support them in benefitting from the capoeira classes. Independent actions could include finding venues for training, advertising of classes, engaging volunteers, taking photos of the classes for marketing purposes (and editing the photos), using social media to manage and build a community, capture stories and information from the projects. The success of the role will depend on your own resourcefulness, hard work, and inspiration. The social capoeira trainer will receive a Monitoring and Evaluation (M&E) training as well as ongoing M&E support. As the main point of contact to the students, they will be expected to provide a range of essential material on the progress of classes and students. This will include verbal feedback, class registers, stories of change, photos, films and short surveys. Active observation, an inquisitive mind and relationship building will be vital in order to gather the necessary information. You will be responsible for coordinating and implementing the project’s activities (also the implementation and development of a community class on the weekends/evenings). T This includes coordinating, and liaising with local organizations and communities. You will also organize and coordinate workshops, trainings and be an active advocate on social media tools to raise awareness. You will be supported by the C4R in implementing these activities. Support other Capoeira Teachers in planning and implementing workshops, performances and events according to the programme goals and milestones. Basic level of spoken and written English with the drive to improve! Knowledge of Arabic language with the drive to improve! 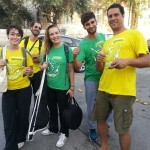 Email the application to mail to: Jobs(at)capoeira4refugees.org. In order to minimise administrative costs, Capoeira4Refugees will only contact short-listed candidates.